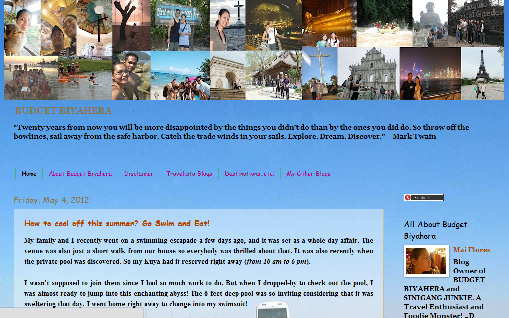 Blog Description : Budget Biyahera is a travel blog. It also speaks of budget travels and other family-oriented journeys. Mai is a Clothing Technology graduate from UP Diliman. A fashion design graduate turned Freelance Writer / Travel & Food Blogger, she now enjoys every moment in her change of careers. She mostly blogs about her love for traveling, while documenting (with photos, travel cost sheets, etc.) her trips from different parts of the Philippines and Asia. She also aspires to travel around the world, and also hopes to publish her stories in God's pleasant time. Mai started blogging about her travels after realizing that she wanted to share the 'budget-conscious-wanderluster' in her. She started blogging in 2008. She also grew up with a family of 13 members. And this meant getting trained to learn the disciplines of keeping everyday things on a budget. And ever since then, noting expense breakdowns, and making various itineraries for her family and friends made her hone this 'organizational' skill. Later, putting this to good use in terms of traveling local and international destinations. Mai has gone past the stage of noting travel-related stuff on her notebook, which lead her into exploring the dainty features of a blog. She started on the Wordpress platform, which eventually lead to her transfer to Blogger. Mai's favorite blog post would have to be her very first entry: The Birth of Budget Biyahera . Her late father's influence has brought her to love traveling. He helped her embrace the wanderluster in her. Lizzie - Spread the WORD! yehey, proud of my sister, Budget Biyahera! 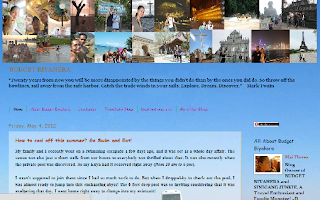 sana ma-discover din yun English version: cheap travel for women. haha. This is a great opportunity, congrats! It's nice to know a certain Fashion Design Graduate turns into blogging :) Now that you've found your real passion, we are here to support! Your passion will always find the way for you to be at ease, to be well-comforted, and to be with your own. Mai, you've found it. Make the best of it. Congratz. More power! Congrats Mai and keep it up. I truly enjoy reading your posts and been excited with your whereabouts. I have visited Budget Biyahera a lot of times and every visit is like a new experience. Love Mai's way of writing :) She's cool! Definitely a worthy blog to be featured here! One of my favorite sites. Mai is also a supportive blogger. Her comments in my blog are always insightful. She clearly reads the post and shares her opinions intelligently. Salamat po ulit Ms. Maxi, thank you for the kind words. :) Sir AJ, THANK YOU! I make sure na laging malaman ang comments ko..hihi! Salamat sa acknowledgement. :) Hey Berylle, kaka-touch naman. :) Hi Chrisair -- Actually, I've found blogger a lot easier to manipulate compared to WP (that's just me). :) Thank you po sa lahat ng nagVisit at nagbasa nito, merlmd, RM Bulseco, April, Liezel C.
Mai, your posts really helps people to travel on a budget. Cheers to more posts from you! Kudos Ms.Tess for launching this blog and this new feature. It is a boost to the FBW members. You have a good material in Ms. Mai and have been following her blog since we had the ComEx.Hope to be featured here too! Great to know more about Mai. it. You're such a person with intellect but of great humility. Thank you @doc merlmd,I am very much happy to feature you in FBW.Thank you guys to all your heartwarming comments. Naaalala ninyo ba ng high school kayo iyong libro na binasa ninyo sa Filipino?History book? Literature? at ang Librong isinulat ni Rizal. Naisip ko lang maraming taong nagdaan na pala..sa ASIA alam ko kasama ang Pilipinas sa MAPA..
Bakit kaya? kasi po tayo mismong mga Pinoy ang sumisira rito. We don't respect our selves. kanya kanya tayo. Crab Mentality..we all have that. Sana naman Mahiya tayo kahit kunti lang..gumawa naman tayo ng mabuti kahit simple lang ng walang kapalit..
Kailan ko kaya mababasa sa newspaper na ang headline hinde tungkol sa Actress or Actor? hinde sa Pag patay? Sino kaya ang ang magkakaroon ng lakas ng loob na mag bandera ng economic statements ng bansa natin?..Sino kaya ang maglalakas ng loob na magsasabi na Panalo kami ng Bayan ko..
well, isapa..Sa mga models..Sa india, indian citizen ang mga models nila pure indians as respect to their culture, even on China, Korean, and other Asians..
Pero sa Pinas walang Respeto sa Sariling Kulay at Bayan..
Sa Sports AZCALS, more Players their are not Pilipinos.. They're Half Filipinos, yes they are..but, marunong ba silang magtagalog? hinde nga eh..diba? Sana naman kunting respeto sa Pangalan ng Bansa natin kahit kunti lang nasa Flat world na po tayo..